In kindergarten, kids start to experiment with measurement for the first time. Eventually, that means learning to use a ruler, but at first, they “measure” with things like spoons, blocks, and paper clips. You can make measurement fun by helping your child create her own personal record book. She’ll record all her vital statistics, from head to toe, and create something fun to look back on when she’s long past kindergarten. For more fun and engaging educational activities check out https://www.education.com/resources/math/. If your child is game, have her help with the lettering for the title page. If she needs help, you can write the title and date for her. Encourage your child to write her own name. You can help your child by writing her name in dot letters for her to trace over if she needs extra support. This book is a great excuse to get kids familiar with the concept of measurement, and to help them create something featuring their favorite subject…themselves. Handprint: Pour paint into the tray or onto the paper plate. Dip the palm of your child’s hand into the paint, then, spreading her fingers out so you’ll get a clear print, press her hand firmly onto the page. Footprint: Follow the same directions with your child’s foot and make a footprint on the next page. Height: Forget the ruler! Measure your child’s height using the string, then cut the string at the appropriate mark. Lay it out on a table and give your child his “measuring tools”: paper clips, spoons, and hands. Ask her to figure out how many hands tall she is, how many paper clips tall, and how many spoons. Title a page, “How Tall Am I?” and record her answers in the record book. My Belly: How big is your child’s waist? Use the string to find out. Then let her measure using her tools! My Family: Your child is probably curious how her stats stack up to the other members of the family. Measure siblings, parents…even the family pet with string, and let your child repeat the process for each of them, recording their “measurements” in the book. Long Jump: Kindergarteners love to get active. Give your child a starting mark and ask her to jump as far as she can. Mark her landing spot with a paper clip. Then let her use her tools to measure how far she jumped. Write it down. Stamina: Counting is a key element of kindergarten math. Bring it off the page and into the real world, by asking your child to do as many push-ups as he can in 1 minute, then as many sit-ups as she can in the same length of time. As she’s doing each of these exercises, she should count out loud. Record the results in the record book. 100! : By the end of kindergarten, students are typically expected to be able to count from 1-100. Ask your child to count as high as he possibly can, then record the results, and the date. You can add updates throughout the year. Other Facts: This book is mostly about measurement, but why not throw in a few other interesting facts? Ask your child her favorite color, number, toy, game, food, and book. Let her tell you her best friend’s name, her favorite vacation, and what she wants to be when he grows up. Then record the answers. 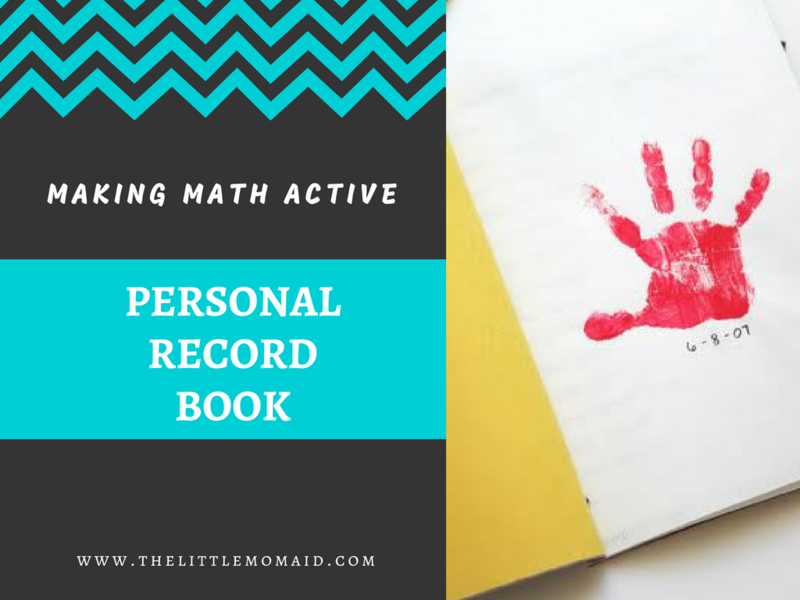 A Personal Record Book can be completed in an afternoon, or you can extend the exercise deep into the year, adding measurements in inches once your child learns to use a ruler, updating her jumping or counting prowess, or adding any other facts you’d like. Either way, it’s a fun excuse to turn math active!